They don’t call this area the Land O’Lakes region for nothing! They should also call it the Land O’Fish region. We’re right on Little Marble Lake which will amaze you with it’s calm and quiet waters. A small lake, there are few motorized boats on it yet you can expect to catch some good sized bass and trout. If you are an avid boater, fisher, water-skier, or long-haul canoeists, you can keep busy for hours on the huge Lake Mazinaw and other lakes nearby. No boat? 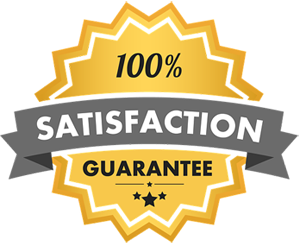 Rent a motorboat or pontoon boat at Smart’sMarina. 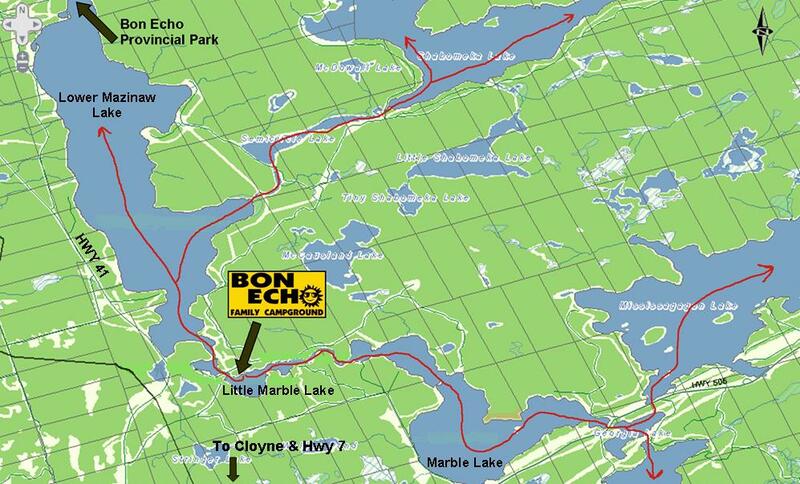 Bon Echo Family Campground is located right on the headwaters of the Mississippi River—a waterway and popular canoe route that flows 200km from Mazinaw Lake in the west to the mighty Ottawa River. This route offers a mix of river and lake travel with class I – IV whitewater depending upon water levels and flow conditions. A trek through the area lakes and streams is a journey through history; rocky shores scraped by advancing glaciers; potholes gouged out of the granite by swirling rocks and water; ancient paintings by native people; old log slides, dams and mill ruins. Canoes and kayaks are available for rent from Bon Echo Family Campground as well as the Provincial Park. Start planning your trip by viewing the campground area canoe route options as well as the Mississippi River route complete with portage locations. We’re in ATV country! You will love the vast network of ATV trails in the area, allowing you to explore hundreds of kilometers. Bring your map or GPS so you can make it back for dinner! Check out the local ATV trail information as well as the trails closest to the campground. If camping doesn’t provide enough green in your day, hit the links! Hunters Creek Golf Course is only minutes away. Also, just down the road on Hwy 41 is a free outdoor tennis court. Mountain bikers will enjoy remarkable scenery and differing terrains to challenge bikers of all skill levels. With over 58 kilometers of Crown access roads and a multitude of off-road trails through the forests and around the lakes of the North Frontenac Park Lands, bikers will take in stunning vistas from sandy beaches, pristine lakes and upland hardwood, to igneous substrata, granite slopes, rocky bluffs and outcroppings. Literally miles of old trails, utility right of ways and old logging and Crown access roads wind their way through the forests and between the lakes making the nearby Bon Echo Provincial Park and North Frontenac Park Lands a hiker’s paradise. Discover how life was like for the early pioneers of the area at the Pioneer Museum. Get up close and personal with a variety of bird life at the nearby Bird Zoo. Handle live snakes and learn about wildlife and history at the both wildlife and history Bon Echo Provincial Park visitor’s centre. Enjoy pony rides and learn all about animals at the Land O’Lakes Petting Farm just minutes down the road. Mazinaw Lake & Cliffs Tour Boat: a 26 passenger boat provides a casual tour of Upper Mazinaw Lake. The cruise is led by an interpreter who explains points of interest along the way. Learn about the fascinating features of the majestic Mazinaw Rock, the 1000 year-old native pictographs, and the ancient cedar trees that have survived for hundreds of years. Read more. Mugwump Ferry Ride & Cliff Hike: a 12 passenger pontoon boat takes you across Mazinaw Lake to the massive Mazinaw Rock. Once there, you can ascend the 200 foot cliff using safe stairs and then hike to some spectacular lookouts. Read more. Bon Echo Visitor’s Centre: handle live snakes, view captive animals, get up and close with a black bear and other animals (stuffed). See exhibits depicting life in the 1800s and learn about the rich history of the area. Bon Echo Art Exhibition and Sale (late July): This annual event attracts dozens of artists and hundreds of visitors from all over Ontario. Read more. Kingston (1hr, 20min): Visit the personal residence of Canada’s first Prime Minister, Sir John A. Macdonald, tour historic Old Fort Henry, go back in time in one of Canada’s oldest cities. More. Napanee (1 hr): Discover Avril Lavigne’s historic home town. With it’s beautiful downtown, numerous mansions, Napanee was also frequented by Canadian Idol Ryan Malcolm and Canada’s first Prime Minister, Sir John A Macdonald. (1 hour drive) More. Other area cities/towns include: Tamworth(40 mins), Tweed(40 mins), Renfrew(40 mins).